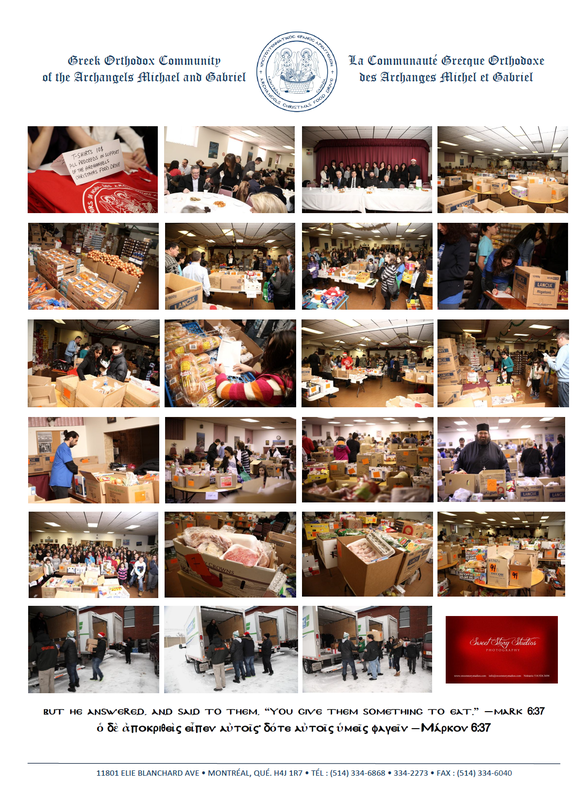 Once again this year, the Ladies “Philoptochos” Benevolent Society Chapter and the Young Adults Group of the Greek Orthodox Community of the Archangels Michael and Gabriel – domiciled in the Ahuntsic-Cartierville Borough – engaged in parallel efforts during the Christmas season to distribute gift certificates and food baskets to less fortunate families across the Island of Montreal and the greater metropolitan area – including Montreal, West Island, Laval and the South Shore. The Archangels chapter of the National Greek Orthodox Ladies “Philoptochos” Benevolent Society was founded in 1969 – “Philo-ptochos” means “friend of the poor” in the the Greek language. Every year, the volunteer members of the Ladies “Philoptochos” Benevolent Society Chapter single-handedly organize a number of popular luncheons for parishioners – including the New Year’s “Vasilopita” Luncheon and the Palm Sunday Luncheon – and regularly provide catering services during church memorial services that are greatly appreciated by the families of the dearly departed. The proceeds and donations received from all these activities are dedicated by the Ladies “Philoptochos” to various charitable causes, including emergency support to local families in financial distress, sponsoring a poor child in a Third World country, and their Easter and Christmas food programmes. Once again this Christmas season, the Ladies “Philoptochos” contributed about $4,000 toward the purchase of gift certificates (redeemable at grocery stores like Mourelatos, Maxi and others) and delivered the gift certificates to twenty less fortunate families. 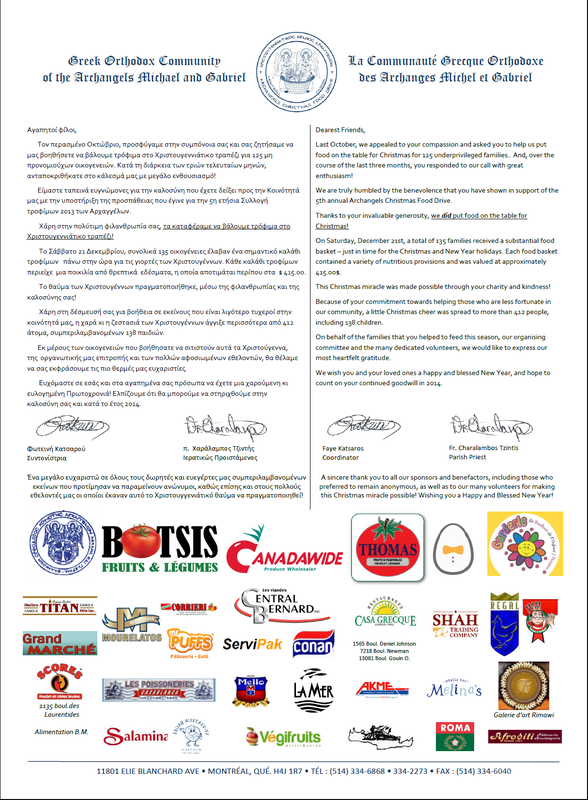 For the fifth consecutive year, the Archangels Young Adults Group solicited the Greek business community, including 45 local food manufacturers, distributors and retailers, who made generous donations in kind with an estimated retail value in excess of $39,000 and the Group also collected cash donations from 280 individual members of the Greek church, school and community in excess of $22,000 that were used to purchase additional food items. Numerous dry goods and fresh goods (in bulk form) including dairy products, meats and fish were received, warehoused, sorted, cut, divided and re-packaged into family portions, packed into boxes, and prepared for delivery directly to each family’s home thanks to a small army of volunteers young and old. For the better part of one week in late December, the Archangels church hall and dining room appeared to have been converted into an industrial warehouse and distribution centre which led some parishioners to question whether the church hall and dining room was the ideal facility for such a large scale food service project. Ultimately, the Young Adults Group distributed a basket of foods worth about $415 to each one of 135 families and thus reached out to more than 412 individual family members including 138 children. Surplus cash donations received by the Young Adults Group (in an amount not yet disclosed as of the time of this publication) will be used to purchase gift certificates from Maxi, Walmart and other like stores in the future and will be distributed by the parish priest to families in need from time to time. The Greek Orthodox Community of the Archangels Michael and Gabriel was incorporated on May 16, 1968 and founded in the Cartierville district by a group of 100 Montreal residents of Greek descent, many of whom were English-speaking and first-generation born in Montreal, who initially called their new parish project « Our Very Own » and eventually named it in memory of their popular Socrates Greek School teacher Michael Stavrides.